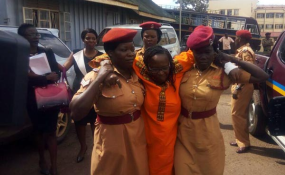 Stella Nyanzi arrives at court supported by prison warders. She told court she was not feeling well. Four Makerere University students have been arrested at Buganda Road Magistrate's Court where they had gone to attend the hearing of a case against Dr Stella Nyanzi who is charged with computer misuse. The students were arrested after holding a demonstration at court over the arrest and imprisonment of Dr Nyanzi, a research fellow at the university. The students, donning the Makerere University gowns, said government should release Dr Nyanzi because they are missing her lectures. The students whose details could not be readily established were taken to Kampala Central Police Station. Earlier, Dr Nyanzi's lawyers had told journalists that her case had been delayed because she woke up today morning feeling unwell. Copyright © 2017 The Monitor. All rights reserved. Distributed by AllAfrica Global Media (allAfrica.com). To contact the copyright holder directly for corrections — or for permission to republish or make other authorized use of this material, click here.